Micky Mouse & Minnie Mouse 90th Anniversary Edition by James Jean x Good Smile Company! To commemorate the 90th anniversary of Mickey Mouse, Good Smile Company presents sculptures based on the works of world renowned artist James Jean. 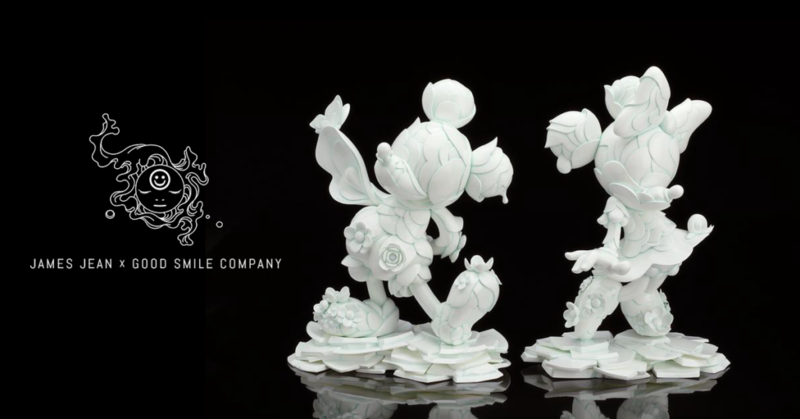 This sculpture set of Mickey and Minnie not only showcase the fine details of James Jean’s artwork, but also feature a unique porcelain-esque paint job, captured with close supervision of James Jean himself to ensure a faithful rendition of the original work. The set is a must-have collectible for both fans of James Jean and Disney, so be sure to add it to your collection! For those with deep pockets, this 9.8inch Mickey & Minnie Mouse painted sculpture set will set you back $1500 + shipping. Please note: this is Phase 2 of the series, being the final 300 pieces. The first 200 pieces sold in Phase 1 earlier today. Total of 500 pieces. The Phase 2 sets will ship in Fall 2019. You can purchase this Mickey & Minnie set HERE. For those that don’t have $1500 to spend this close to DesignerCon, you can opt in for the Blind Box version for $60. Six colourways available, three of each Mickey & Minnie. Whilst they are blind boxed, it seems to suggest that the $60 gets you the set of six colours. Unless they’ve worded it incorrectly. From the Good Smile site, it says “Total of 6 to collect. (1 boxset includes all 6 varieties)”. Anyways, if you’re interested in copping these miniature figure (around 3.9inches tall), you can purchase them HERE.